with Premier League rivals Manchester City. The 25-year-old moves to Eastlands for a reported fee of £7m. boss Roberto Mancini's first signing of the summer. quality we already have here because we have a fantastic squad," he said. won't be bothered by United fans." been linked with Liverpool and Roma. seasons following Cole's move to Chelsea. "good bit of business" for Arsenal. pleased with what he achieved at the club," said Keown. feel that Wenger should buy another left back." playmaker Cesc Fabregas again being linked with Barcelona. to be a target for both Manchester City and Manchester United. 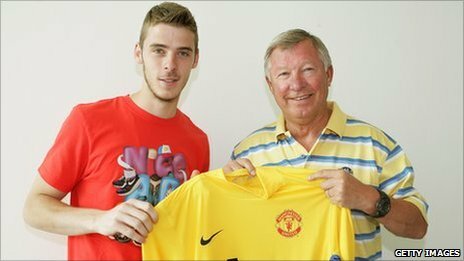 David de Gea from Atletico Madrid on a five-year deal. Monday and will finalise what is thought to be an £18.9m move on Friday. makes you very, very happy. I'm keen to do my best and show what I can do." Gianluigi Buffon, who cost Juventus £32.6m in 2001. League against Porto in September 2009.
retired after the Champions League final defeat by Barcelona in May. working on the De Gea deal for "quite a while". an extra motivation to work even harder to show off my ability. "It's a great privilege to be part of a club like United." Ashley Young will finally complete his £16million switch to Manchester United in the next 24 hours after coming through his medical. Young was assessed by United’s medical team this afternoon at the private Bridgewater Hospital near Manchester city centre. Young’s tests were the final hurdles in his move from Aston Villa to Old Trafford and the transfer was agreed earlier this month before he went on holiday. The England winger will sign a five-year deal with United, which will double his wages to £130,000-a-week. Premier League rivals Aston Villa on a five-year deal. with the league champions on Thursday. 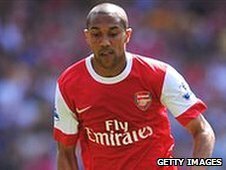 one I couldn't turn down," the former Watford player told MUTV. Hornets but only had one year left on his contract. the £9.65m transfer fee Villa paid to take him from Vicarage Road. achieve promotion after they beat Leeds United in the play-off final. in the friendly against Austria. to take it with two hands." first to respond to the arrival of Young at Old Trafford. the Ashley Young deal has been finalised. Great addition to the squad." winger would benefit from the prospect of playing for Ferguson's team. Watford," Boothroyd told BBC Sport. creating one for a team-mate. will stretch him again, but he has the character to handle the next stage." said that midfielder would prove to be an invaluable asset for United. product and he will get plenty of opportunities to do that at Old Trafford." thinks Young and United will suit each other perfectly. will have more at United because he will have so much more of the ball."